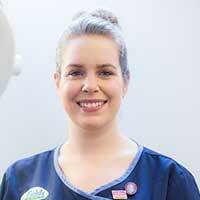 I qualified from the Royal Veterinary College at London in 2010 and started working at Fields in September 2011. I have recently become the Head Nurse and I enjoy all aspects of nursing but particularly enjoy surgical nursing. I am currently studying the International Society of Feline Medicine diploma in feline nursing and am working towards gaining our feline friendly practise accreditation. I have two rescue cats called Harry and Georgie that came to the practice as strays and two rescued greyhounds.